I’d seen this guy on another blog or two, and just couldn’t resist him when he came up on a local auction. Crazy price, but just had to have him. 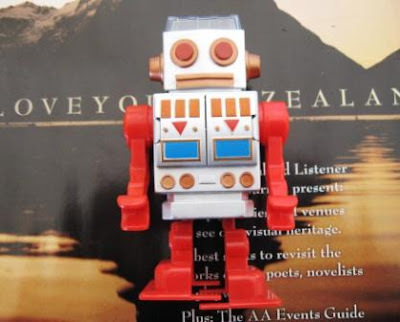 He stands about 10cm (4 in) tall. 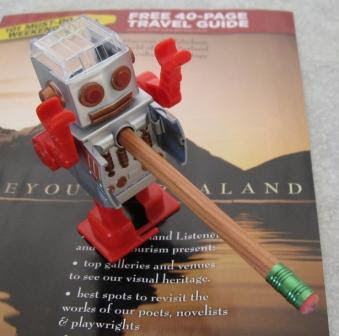 Open up his chest to sharpen your pencil. Sharpening winds his little motor up and then he’s off for a walk. There is also a key to wind him up if you just want to go for a walk without sharpening a pencil. Rotate his arms up as a pencil rest. 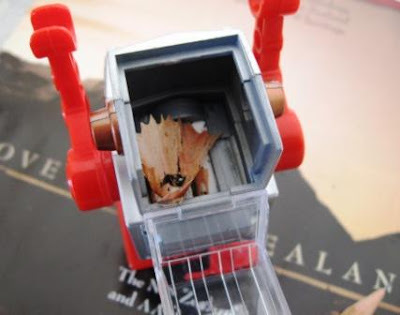 Word of warning – the sharpeners wind-up mechanism is likely to mangle the shaft of your pencil, but it does put a good sharp long point on it. Shavings go into his head. Flip top to empty. Viewing the Paradox online, I wasn’t really sure I would like the colour scheme of those black and silver alternating sections. In the hand I was initially equally unsure, but it really grew on me, and now I definitely like it. It is certainly a rather unusual and unique decorative scheme. The black sections are plain smooth gloss, described as “lacquer” although I don’t imagine that’s the natural tree lacquer, rather the chemical factory lacquer. The silver body sections are sterling silver and have a sort of wave and chevron style pattern engraved into them. The pattern is not particularly deep so overall the look and feel is still generally smooth. Having said that, the pattern definitely works as a grip enhancement, and I’d say Franklin-Christoph have definitely got this aspect of the pencil correct. One thing I do find a little curious is that only the body sections are silver. The other “silver” metal trims - pocket-clip, tip section and end cap & button - are chrome. At first I found this surprising and incongruous, but I got over it. Still, overall I think all silver might be better. Franklin-Christoph don’t over-advertise themselves on this pencil. Their name is lightly engraved into the tip section, and their logo into the top of the top-button. A very small hallmark is stamped into the lower silver section, but not the upper one. Whilst I’ve got some familiarity with UK hallmarks, I don’t know anything at all about this presumably US (or maybe EU) hallmark. Feel free to educate me. Its 925 in an ellipse which obviously means sterling silver. The rest though is partially stamped into the patterned area and very hard to read, even with my 10X jewellers eyepiece. It appears to be something like a five-pointed star and then the lettering 105/MI all inside an elongated hexagon which is presumably the maker / inspectors marks. Despite this pencil being a luxury item, I feel it has certain design elements reminiscent of a technical draughting pencil. 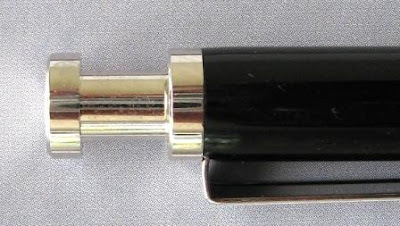 The sharp deliberate step into the tip section, the stepped shaft of the push top button and the plain but sword design pocket clip. These definitely impart a design office look. Well, at least to my eyes they do. A draughting style lead sleeve would have completed this look, but actually it’s a non-retractable tapering come. Picking it up, the Paradox is heavier than anticipated, and top heavy to boot. The grip is on the narrower side of town, but overall it looks and feels good in the hand. The lead advance mechanism is a standard push top ratchet. 10 clicks will get you about 9mm of the 0.7mm lead. The action is quite a long stroke, and doesn’t feel particularly smooth. Only light pressure is needed. Taking my cue from previous commenters, the shaft of the top button definitely feels like it is metal on metal when you push it down so I imagine it will scratch up over time. Disappointing. A simple plastic sleeve inside the body would presumable greatly alleviate this problem. Now, this is something I am really getting sick of, and I imagine you are getting sick of me going on about it. No refill instructions yet again!!!!! I couldn’t find any instructions on the FC website either. One would be forgiven for assuming it was an ordinary end refill system – just pull the top button off and stick some leads in. But no, that top button is stuck on good, not going anywhere. Obviously no tiny eraser under there! That then leaves only the annoying tip refill. Yes, you unscrew the tip section from the body and refill the lead chamber. You also have to have the top button in the correct position when you reassemble otherwise the push top ratchet system won’t work. It is just plain old unacceptable that you don’t get instructions explaining all of this. Whilst we have the pencil disassembled, you can see the words “Schmidt” and “Made in Germany” amongst the markings on the working innards. The Paradox comes in a black presentation case – fake crocodile skin, but it looks quite nice. Their FC logo blends in well on the inside. Why did I buy this pencil? 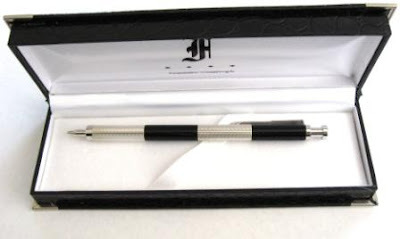 Basically I was rather intrigued by the look of it (those alternating silver and black sections), and I was interested in adding something from the Franklin-Christoph stable to my collection. Am I happy with my purchase? Yes. Best Points – The combination of technical and luxury looks. Not So Good Points – Refillings a bit cumbersome. Dimensions – Length 142mm, diameter 9mm. Balance point about 75mm up from the tip. Note - The Paradox MP was discontinued during the preparation of this review. 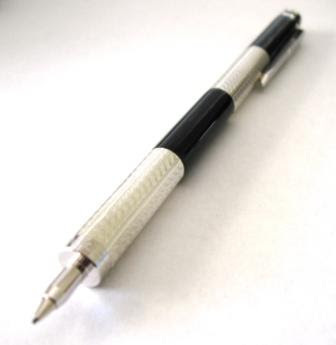 From the Franklin-Christoph website, “The Model 08 Paradox was our flagship writing instrument from 2001-2008. 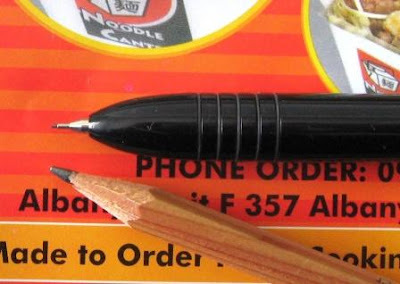 It was available in a click ballpoint, and .7mm MP from 2001-2007, and a .5mm MP briefly in 2008”. However, I’m sure eBay and other sources will supply all your Paradox needs for a while yet. The 5.6mm sketch pencil model is still available. 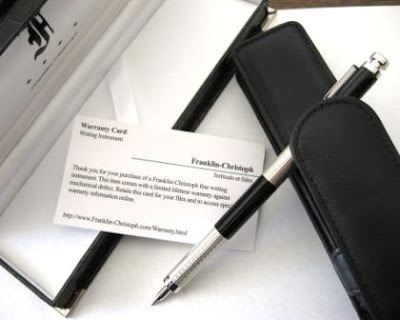 Note – I try to stay away from commercial endorsements, but as an “international customer”, I was pleasantly surprised to note the free international shipping on the Franklin-Christoph website. Pity I paid for shipping ages ago when I bought my pencil from another retailer! Them’s the breaks. I’m curious about the spread ofthe newer Pentel Ain lead versus the old Super Hi-Polymer. 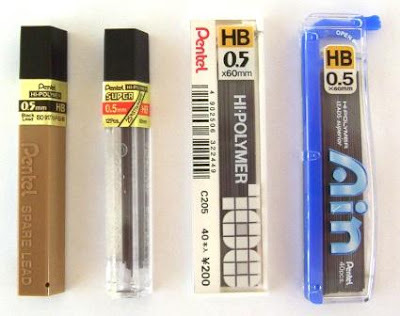 To me the Ain packaging is much more eye-catching and marketable, yet I get the impression that Ain has not made it everywhere, some Pentel distribution areas seem to be sticking with the old Hi-Polymer brandname and packaging? 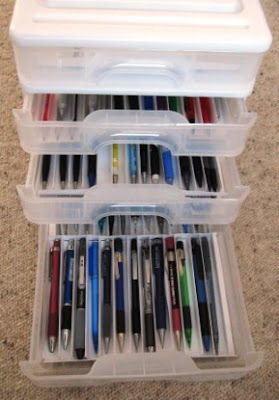 So, a little survey, please leave a comment and let me know what Pentel lead is common in your country. 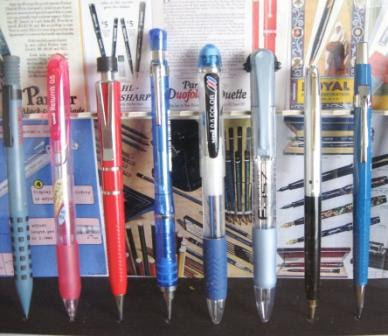 Equally if Pentel lead isn’t common in your country then I’d be very interested to know that, and if not Pentel, what brand is common? My wafflings on erasers have started a few discussions with various people, including “Joy of Erasers”. [Broken link removed] As someone in the book conservation-restoration industry, J uses many an eraser to remove old margin notes, scribbles, dirty marks and other detritus that accumulates on old books, so I always take her eraser opinions seriously. A while ago she sent me a couple of her special Inkredible erasers. I haven’t actually discussed these erasers much with her, but I get the impression that when you’ve got some serious extra-heavy duty erasing to do, when its time to get out the “Big Guns”, then these Inkredibles are it. The name Inkredibles would imply they are aimed at the scribbles of the Ink-Lords rather than us graphite-folk, so I wasn’t sure of their place on a blog like mine, but J replied that as well as ink they “they will do a good job on pencil, crayon or bug poop and what have you.” So, how could I resist? I’ve got to say I certainly got a surprise when I opened up the parcel containing them. I don’t know what I expected, but it wasn’t that. 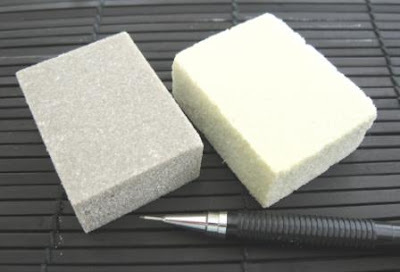 They are oversize compared to most normal erasers - the white one is “coarse” and the gray one “fine”. 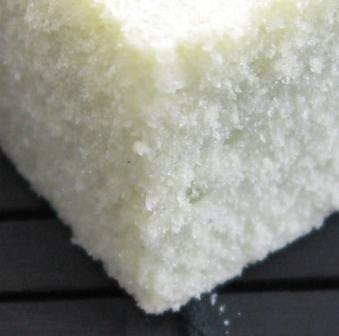 They are a gum eraser with grit. The gum is soybean oil based and there’s lots of grit in that white one, think “beach”, after you’ve done a bit of erasing and got some residue. Quite frankly, these erasers are way outside my experience and just plain strange to me. I really like the way they look, but they leave a little sandy trail wherever they go. Photo: Just look at the texture on that white one above. Almost like some sort of sugar-delight. Well, time for a little test drive. Whoa, those things will just chew through your paper and out the other side if you don’t watch it. 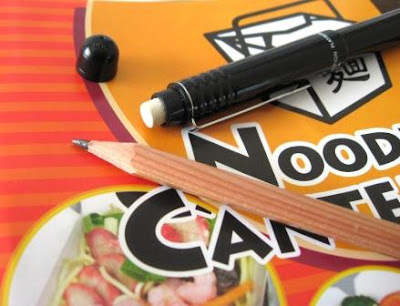 Clearly practice makes perfect, and these erasers are obviously best on quality heavier-weight papers. I didn’t really know what to do with these erasers, so here’s a little test comparison I did between Staedtler Mars Plastic and Inkredible Gray (fine), just on ordinary photocopy paper. Mars is a clear winner on woodcase and mechanical pencil HB graphite. Mars is a complete and utter loser on ballpoint ink. Black and red coloured pencil is fairly even but probably a win to Inkredible. 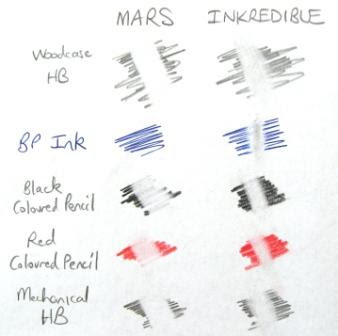 Remember that Mars is basically removing (or not) the marking substance and leaving the paper alone, whilst Inkredible is basically abrading away the marking substance and the surface layer of the paper. I’m sure an experienced Inkredible user would make a much better job of it than me. For another demonstration, here’s a page of photocopy that I had a go at. 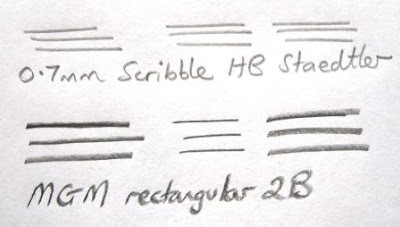 So, its pretty obvious that Mars is better at things we normally regard as erasable, but Inkredible will remove all those other things normally thought of as non-erasable. But use with care! I’m not getting any kick-backs or other inducements to try and get you to buy some of these, but seriously, they are just so crazy I’d suggest you get one of each just for the sheer heck of it. Use with caution. Do not use whilst under the influence of alcohol. Children, please ask your parents first. Quite a long time ago an “Anonymous” reader asked if I would review the Pilot Dr Grip, and I said I would put it on the list. A considerable time passed, and the reader politely reminded me about Dr Grip, and so, here we are. To be precise I’m actually reviewing a Dr Grip Ltd. The “Ltd” is one of quite a few closely related versions of the Dr Grip. I don’t have any of the other versions so I can’t really say what the differences are, but the information on the web implies there isn’t a huge difference between the various models. 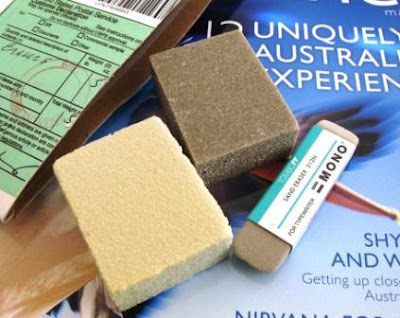 The Pilot USA website says Dr Grip Ltd comes in four different colours, but 0.5mm lead is the only option. As I was using my Dr Grip for review week it occurred to me that this is actually the first pencil with a shaker mechanism that I have reviewed, so I’m going to start with that. On the face of it, it’s an ordinary standard push top ratchet lead advance mechanism. 10 clicks will get you about 6mm of the 0.5mm lead. I quite like this particular push top action – you have to push it down quite a long distance with a reasonable amount of force. It seems a very deliberate positive sort of movement, which for some reason quite appeals to me. However, it’s also a shaker mechanism. I guess most folks will be aware of what that is, but for those who aren’t, inside the body of the pencil there is a weight and if you shake the pencil up and down with a fair bit of force then the weight will operate the lead advance mechanism when it slams back into the front stop of its movement. For further explanation, in the photo above you can see I have unscrewed the body and taken the steel weight off the clear plastic centre-tube which serves as both the weight guide rod and lead storage chamber. Of course for normal lead refill purposes this pencil is just like any normal one - you pull the top button off, remove the small eraser and refill the chamber. 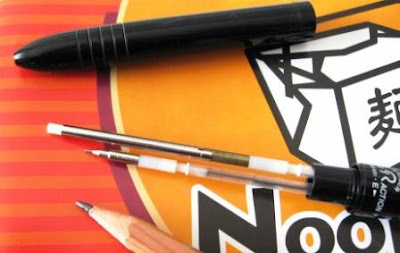 There is no need to disassemble the pencil like I have. I think Pilot have got the shaker mechanism about right – not so sensitive that it is inadvertently activated by general movement but not so tough that you need to shake it excessively to activate it. Right then, a shaker system! So what? Well that’s a fair question. Some suggest it’s the answer to a non-existent problem. I think I’ve got a foot in each camp. The shaker system is primarily a novelty, a good marketing tool and point of differentiation. I believe that’s why someone invented it. Having said that, I am tempted to think that if you were in a speed writing situation, pouring forth an examination masterpiece, that the shaker system and a quick flick of the wrist might help to keep you “in the flow” as opposed to pushing the top button. But it’s pretty debatable. Basically I think if you like it, great, if not, push the top button and forget about it. Up above I’ve briefly mentioned the small eraser under the top button. It’s standard emergency use type stuff. At the other end of the pencil the lead sleeve is a tapering cone, non-retractable so this pencil is for general writing only and not really fully pocket safe. The name Dr Grip just doesn’t do it me. To be honest it conjures up some mental images that aren’t particularly pleasant. Most, or all, of the Dr Grip variants have an “Ease-of-Use Commendation” by the (US) Arthritis Foundation, and perhaps this is where the Doctor and Grip bits come into play. On the back of the blister-pack that my pencil came in there are five bullet points, two of which relate to this. The first is “Relieves writing stress and reduces required gripping power” and the second “Great for people who write a lot”. I don’t know how the Arthritis Foundation judges ease-of-use but it seems writing instrument with fairly large diameter rubber grips pass. 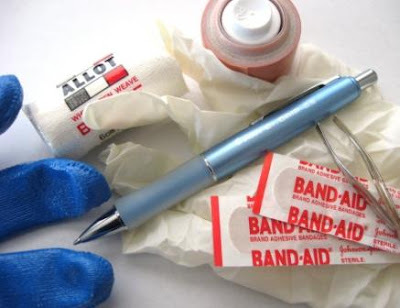 So, the Dr Grip has a smooth plain rubber grip of about 12 to 13mm diameter which qualifies as a large diameter grip. The grip slowly flares out towards each end. The rubber compound is quite hard, not really much give in it, but it does have some “grippy” quality so I would say it does provide some small improvement to grip, particularly under lower finger pressure, which may well be the important point regarding arthritis sufferers. You all know my general aversion to rubber grips - for those with normal dexterity I would say the rubber grip is largely irrelevant. There is one thing though about this rubber grip that stuns me. It stunned me the moment I first saw my Dr Grip years ago, and it still stuns me now. The grip looks totally second-rate and just plain cheap. Firstly that milky translucent colour is something I find very unappealing, and rather cheap looking. But that’s a personal judgement. What really stuns me is how it is of a different diameter to the front housing it matches (sic) up to. I just cannot believe this. 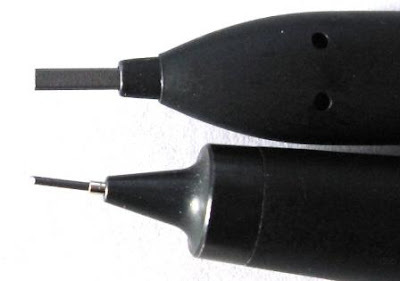 Pilot are a major manufacturer, a world force in writing instruments, and one of their flagship items has this grip that looks like a piece of oversize rubber tubing, chopped off to length and just pushed up over the pencil body. At the top end the grip matches diameters with the body, at the bottom end it just sticks out, all half-finished, cheap and nasty looking. Shocking. It’s appalling, like something you might find on the cheapest nastiest piece of junk you could buy from the One Cent Shop. I can’t believe that some designer didn’t get the chop over this, but since they keep selling it, I guess not. Maybe the rubber grip is plain tube looking because it’s supposed to be replaceable? That would be some sort of excuse, but I haven’t seen anything about it being replaceable. Did I miss this on the websites? Right, on to something a little more positive. The pocket clip is a very good design. It’s a sturdy piece of metal with good flexibility and strength, set into a recessed section of the body which helps keep good visual symmetry - unlike that rubber grip. (Grrrr!) The only thing against the pocket clip is that being recessed it doesn’t do a great job of stopping the pencil rolling on your desk. As far as actually writing with Dr Grip goes, it’s not too bad. It’s easy to hold, the weight and balance are good, I like using both the shaker and the push top button. Personally I would have liked the mechanism to advance a little more lead per activation. “Pilot Dr Grip 0.5” is boldly printed on the body, along with “Pilot Japan” moulded into the body in small lettering, and “Pilot” embossed into the pocket clip. So, no doubt about its heritage, except that its only got Dr Grip rather than Dr Grip Ltd printed on it. The overall verdict? I feel I owe some sort of apology to the anonymous reader who has patiently waited for me to get around to their favourite pencil. I hope that this review won’t cause you to delete my blog from your “favourites”, but this pencil is not one of my favourites, it’s “OK”, nothing really stands out and grabs me in a positive way, but something does in a negative way. I am afraid that to my eyes the rubber grip is a visual nightmare, and really spoils the pencil for me. But, if you can overlook that, then Dr Grip does have its fair share of good points. Best Points – I like the shaker mechanism for a change, and even if you don’t shake, as a push top mechanism it’s equally satisfying. A superior pocket clip. The large grip will definitely suit some folks. Not So Good Points – The grip that doesn’t match diameters – a real shocker. A Note: I spent my review week writing with the lead supplied with the pencil, which I assume is Pilot lead. I haven’t reviewed any of Pilots leads, but maybe I should as I encountered an unusual problem. “Paper-gouging”. I seemed to be forever having the leads chisel point or sharp edge stabbing into my paper and gouging or breaking. This is not normally a problem for me so I am going to have to investigate further and report back in due course. A quick look at this one from Malaysian stationery distributor MGM. Actually I previously thought MGM were Korean, but now I’m just confused. 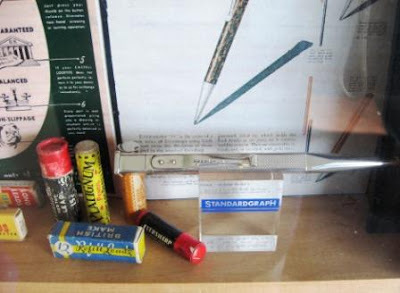 This pencil has two features of interest – the first is that the cross-section of the body is elliptical, and the second is that the lead is rectangular. Below is a selection of photos trying to show the elliptical body, with eraser on top, and the rectangular lead. 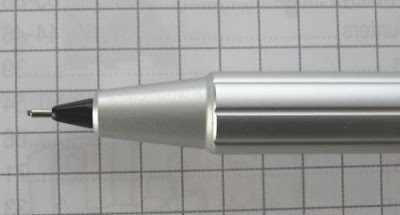 Lamy Scribble with 0.7mm lead is the other pencil in the photos to give some idea of size and shape. The rectangular lead is about 0.9 x 1.8mm. It's an ordinary push top ratchet lead advance mechanism. The lead grade is 2B, and the pencil is noted as “Exam Grade” suitable for Examination, Musical Notes and Jawi Writing. 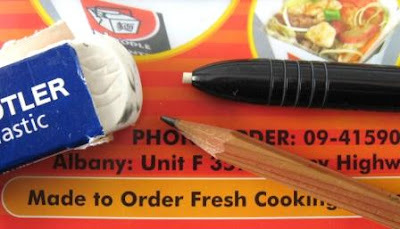 Other statements are “Thick learner’s pencil, Unique non-slip surface and easy to erase”. I’m rather unconvinced about the uniqueness of the surface, but it is reasonably non-slip. You learn something every day. I had not previously heard of jawi writing, but it’s an Arabic script used to represent the Malay language. I did a bit of non-Jawi writing to check out what it’s like to write with such a lead. Kind of interesting really. It’s a bit more precise than I expected. You know I’ve got to say that when I opened up the parcel containing my nice new Lamy Pur, I took one look at that big long presentation tube and started thinking about cigars. Not that I smoke, and I don’t recall my grandfather smoking either, but he did have a lot of cigar boxes which I really liked going through when I was a little fellow. 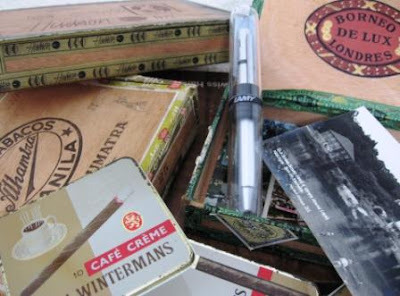 Lots of interesting things in those cigar boxes – but no cigars! Of course with a different background the clear presentation tube looks a modern or futuristic design rather than tobacconist. But anyway, on to the pencil. 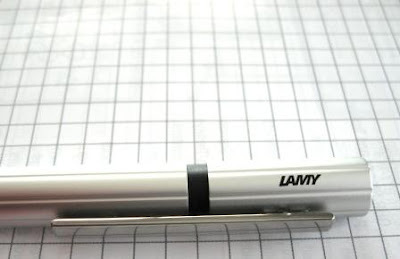 The Lamy Pur is a fairly decent sized pencil, long but solid looking, with some widely spaced longitudinal grooves running the length of the body in a somewhat simple interpretation of guilloche patterning. The body is aluminium with a slightly sandblasted type finish rather than a high sheen polished finish. Some black plastic accenting and a splash of chrome are added for highlights. Overall it’s a fairly simple look, somehow modern yet traditional. For the record, I like it. Picking the Pur up, I was surprised at how light it is. I expected something heavier for its size, but that’s aluminium for you. Somehow the feel in the hand is of a wider diameter pencil than my ruler measures. 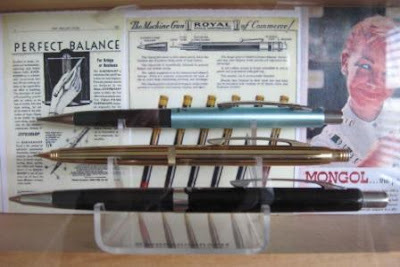 I guess it’s just one of those writing instruments whose looks and feel are a bit of a surprising combination, never quite what you expect, a case one sense misleading the other. There are no grip enhancements, but the grip is reasonable. The lead sleeve is a 3mm retractable thin tube so it would not be totally useless amongst a set of hole templates and french curves. The pocket clip is spring loaded and quite functional. 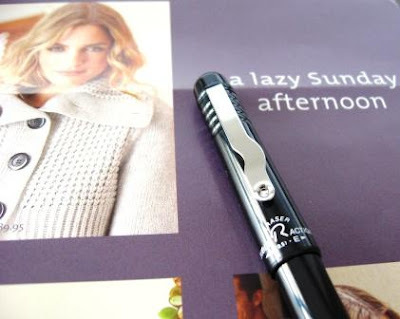 Combined with the retractable lead sleeve we of course have a pocket safe pencil. When it comes to advancing the lead this is a plain old standard push top ratchet mechanism. 10 clicks will get you about 9mm of the lead, which is 0.7mm diameter. I don’t believe there are any other lead diameter options available. 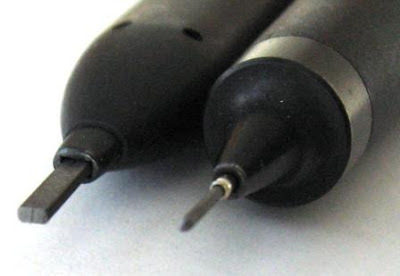 I know mine’s 0.7mm lead because Lamy have thoughtfully engraved a big “7” in the black top cap of the Pur. The only other marking on the pencil is the word “LAMY” in black towards the top of the body. 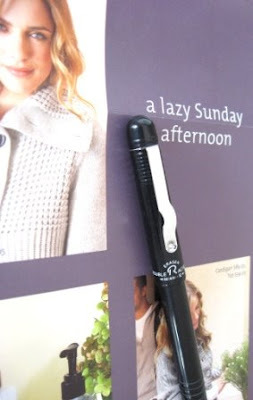 As always, Lamy prefer understatement rather than overkill when it comes to branding. There is no eraser under the top cap because, despite what it looks like, the top cap doesn’t come off. Well, correction, if you pull really hard it does come off, but let’s just say it’s not supposed to, because as soon as it does, the word “Oops” springs to mind. I’m really starting to sound like a stuck record here (that’s old vinyl LP album talk for you youngsters out there), or perhaps in today’s terminology, I’m sounding like a scratched CD on repeat, but yet again I have ended up with a pencil and no refill instructions. So, initially I just assumed you pulled that top section off, seemed reasonable to me, and as you have read above, if you pull really hard it does come off, but there’s no lead refilling to be done under there! 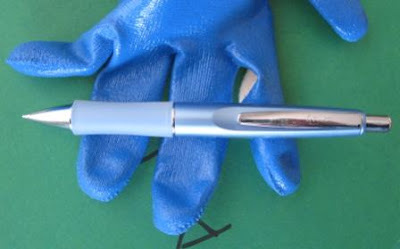 I perused the Lamy website but it did not indicate anything for the Pur. 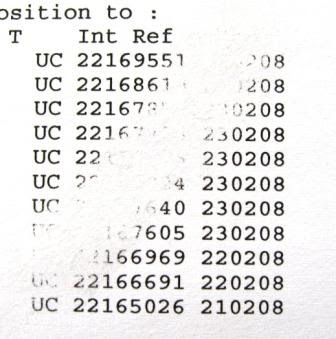 That’s actually rather bad – refill instructions are given for some models, but the list is not complete. Eventually I decided that the only other possibility was for it to be one of those annoying tip refill systems, and I was right. You unscrew the tip to get at the lead storage magazine and to refill it. There is a needle to assist in clearing lead jams, but no eraser. So, the final overall assessment? Quite good. Not great, but quite good. Worth having in the collection. 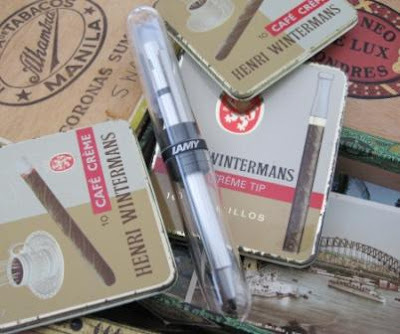 Best Points – Surprising combination of size and weight, and I like the cigar tube presentation case. 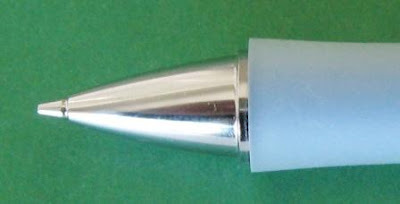 Not So Good Points – Having to unscrew the tip to refill with leads. Dimensions – Length 147mm, diameter 11mm. Balance point about 75mm up from the tip. 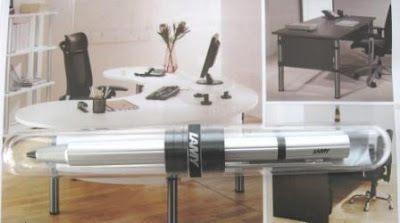 Note: I did find some information indicating that a non-grooved body version is available in Lamys corporate gift range which is not available for general retail sale. Recently I had a burst of “stop mucking around and just do it!”. So the years of procrastination have finally ceased. 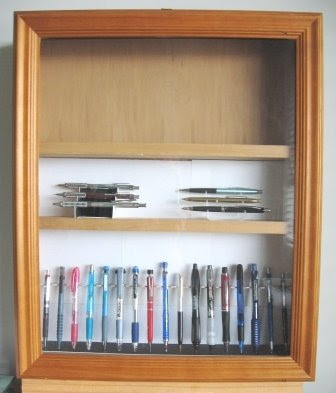 For the lower priced pencils which generally come as loose stock, we have a 4-draw A4 paper tray, as shown above . Using heavyweight acid-free paper and (supposedly) archival quality adhesive I have made some inserts for the trays. 26 slots per layer, 2 layers per tray, 4 trays in the unit so that’s 208 pencils in total. It’s about ¾ full. There are still several storage crates full of boxed pencils down in the storage room. Upstairs in the office at home we now have the display cabinet. 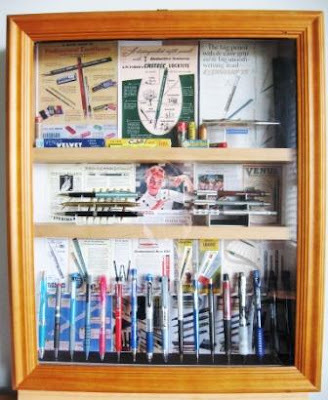 I bought the glass fronted wooden cabinet several years ago – just got around to doing something with it a couple of weeks ago! I put in a couple of wooden shelves, made some little display stands and the vertical rack system out of artcard, etc. The background behind the pencils is removable, so I’m going to have a few different backing cards – some plain colours, maybe some pencil drawings, and some vintage advertisements, as shown in the picture above. The fancy backgrounds do distract a little from the pencils, but not too much in real life. Plain white background as below. Anyway, it’s not totally finished, but it’s a huge leap forward for me. Still got really decide what to put on the top shelf. Well firstly, thanks to everyone who submitted a comment on the readership poll. I wasn’t really expecting that, so it was nice to receive them. I’ll trust that the poll results are reliable, that no one decided to “vote early and vote often” and Zimbabwe the results. 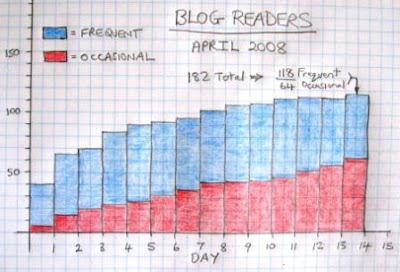 Final figures after the 2 week polling period closed are 118 ‘Frequent’ readers and 64 ‘Occasional’ readers, making a total of 182. For the record, that’s actually a little less than my prediction of 200 – 250. Still it’s good to know how many of you / us there are out there. Right, time for a quick shufti at a pencil I picked up a few years ago, the Platinum Mistake. I don’t know it’s proper model number, and I believe it was discontinued many years ago. So, it’s just a plain black plastic body, certainly not going to win any awards for originality there. There are some grooves cut for the grip-zone, but the only unusual visual feature is the rather strange shallow U-bend in the steel pocket clip. 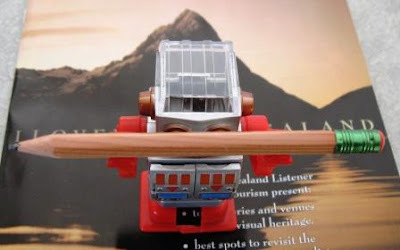 If you twist the upper half of the body one way you push a 0.5mm pencil tip out, which is then operated as a push top ratchet lead advance mechanism. 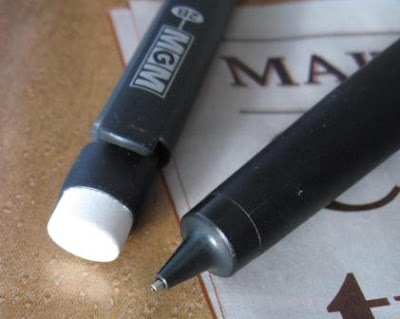 If you twist the other way you get an eraser tip, utilising a 2.5mm vinyl eraser core. That’s definitely on the fine side of average, makes Mars Plastic look gargantuan. I haven’t actually used the eraser so can't comment on its erasing abilities. 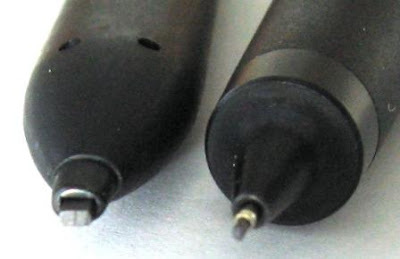 Just so that you don’t feel short-changed, there is also an eraser in the traditional place under the screw-off top-cap! Internally the mechanism looks a fairly standard multi-pen type system. So, nothing flash, but something a little unusual and quite interesting none the less. In some ways I am surprised there aren't more of the eraser-pencil multi combinations, but I guess the small diamater eraser limits their usefulness and appeal.